I Want To Go Black Bear Hunting in Wyoming! Home ▸ Bear Hunting ▸ I Want To Go Black Bear Hunting in Wyoming! 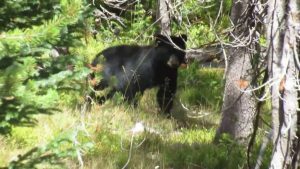 If you are planning on going black bear hunting in Wyoming, you will have a unique experience that will involve a lot of driving, stalking, treestand and ground blind hunting generally in areas that have already been scouted. Black bears are not just black. They are also cinnamon, brown, and black with white tufts on their chest. This type of bear can be recognized by their size and their gait. Black bears, unlike most quadrupeds, move one side of legs together much like a pacer horse. Black bears are found in 40 of the US states as well as all Canada, except Prince Edward Island. Should your trip for black bear be successful, most outfitters will prepare your meat for travel. The process called caping will preserve the taste and freshness of your mean, especially if it’s done correctly. Check with the Wyoming Game and Fishing Department to see if you need reporting your harvest. If you do, use the method that is convenient for you. Another piece of information most outfitters should tell you is that your hunting license is not transferable. This means, if you buy a hunting license in Rhode Island, you cannot hunt in Wyoming. You will need to purchase a hunting license to hunt in Wyoming. You can buy the license online or by mail. Get your application in before the hunting season. This makes sure you do not face fines of illegal hunting or poaching. For black bear hunting, permits are done by drawings using a weighted points system. Wyoming residents will get the hunting permits first. However, they do allow out of state residents to hunt black bear. Check to see if youth needs a hunting license. Special hunts can be called for many reasons. Hunts used to minimize damage to trees by black bears is one major reason. Black bears will strip away the bark from young trees and eat the sweet layers underneath. On average, a black bear can ruin up to 70 trees in a season. Timber managers will call for help to control black bear damage in the tree farms. Over population is another. Black bear hunting in Wyoming can be allowed to manage the population. Controlling the population prevents bears from entering the city limits and harming people. Black bear hunting in Wyoming can be an exhilarating experience. Keep safety in mind when planning your trip. Wear protective clothing, carry enough ammunition, and make sure you have the proper equipment to go black bear hunting.